With continued market growth comes widespread change for Vietnam’s thriving economy—and its agricultural landscape. Recently, Danang took the first step towards better food sanitation by laying out a model of how a city can successfully commit to improving food safety. Soon after the Danang People’s Committee adopted a master plan for sustainable agricultural development in the region. One stipulation of the plan was that local government authorities will triple the amount of land area dedicated to the production of safe food production by 2020. 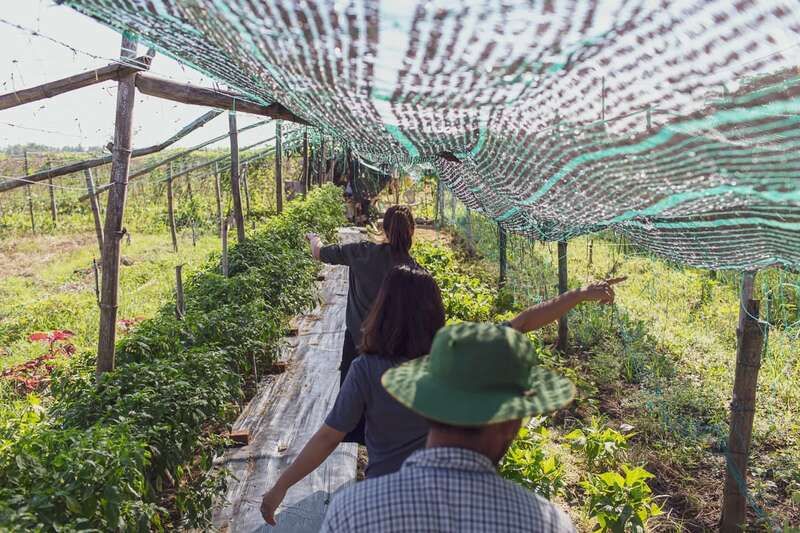 Alongside local government action in Danang, independent organizations have also became involved in Vietnam’s evolving agriculture industry. HealthyFarm is one such organization. The group, a registered local social enterprise, focuses on improving the flow and quality of produce within the Vietnamese food chain. As consumer support and confidence increases, so does demand. To help keep things moving smoothly, HealthyFarm even provides farmers with modern equipment and marketing strategies to widen their distribution margins. 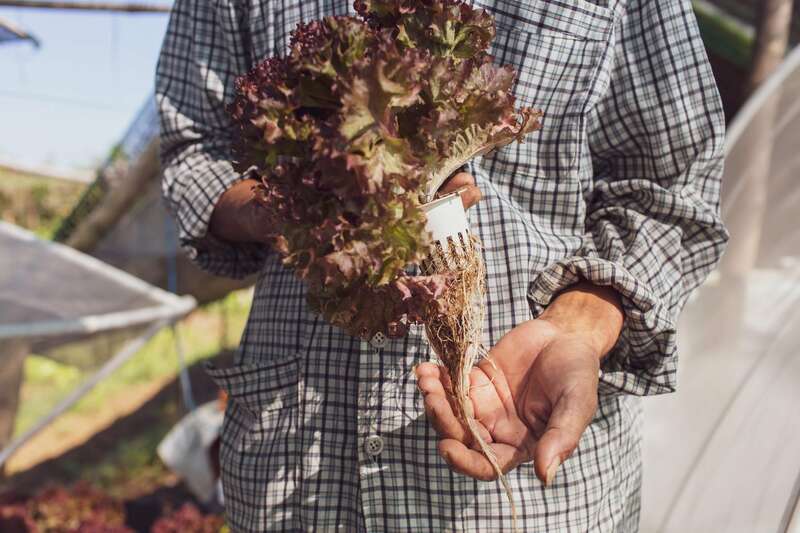 “We connect reliable farmers with consumers looking for fresh food,” says HealthyFarm co-founder and director Dr. Kasia Weina. 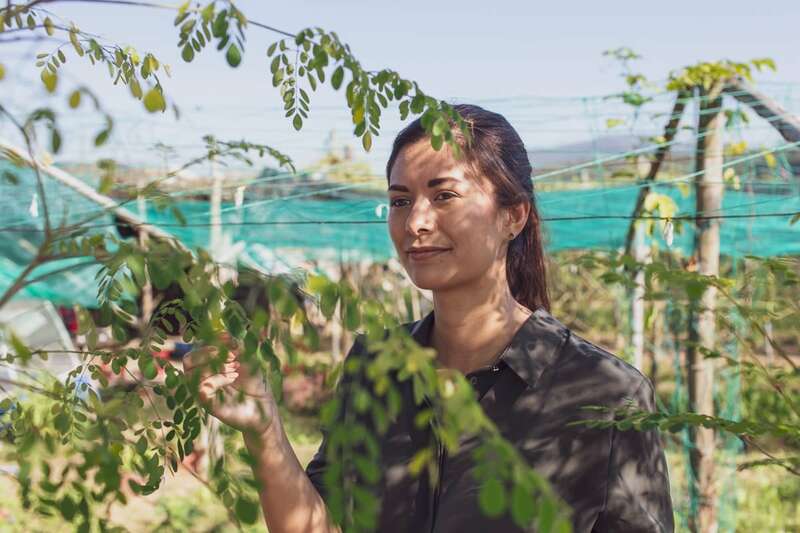 To learn more about how HealthyFarm keeps their hands dirty working on the front lines of Vietnam’s agriculture industry, Vietcetera spoke with director and co-founder, Dr. Kasia Weina. Luckily for us, Weina prefered not to be cooped up in their office, and so together we made the unexpected journey to a picturesque rural farm just outside of Danang. Our end goal was simple; to speak about HealthyFarm’s innovative and replicable solution for improving central Vietnam’s agricultural industry…and to see their innovations in action. Tell us how you got involved with HealthyFarm. Three years ago I came to Danang to launch Evergreen Labs. Evergreen’s mission was to start as a social and environmental incubator, with a particular focus on positive-impact businesses. After six months with Evergreen Labs had past, we were primarily investing in small-scale social entrepreneurial ventures. We weren’t happy with how this model was working, so we re-positioned ourselves by developing the social projects ourselves. This kind of work is much more difficult, but more rewarding. Currently, Evergreen Labs is involved in projects in three focus areas: agriculture, sustainable tourism, and waste processing. HealthyFarm Danang is a direct extension of this, and by far our most developed agriculture project to date. “We saw issues with clean food in Vietnam,” says Dr. Weina of the motivation behind the HealthyFarm project. What inspired the HealthyFarm project? Our original plan at Evergreen Labs was not to work in agriculture. It did however, allow us to identify a gap in the market for a significant agricultural project. We saw issues with clean food in Vietnam and a lack of trust between farmers and consumers. Regulations about food quality were on the soft side, and we were keen to introduce more trusted suppliers within the food produce market. “At our first market, the produce sold out in an hour,” says Dr. Weina of HealthyFarm’s regular farmers’ markets. What were your other motivations for organizing a farmer’s market in Danang? In addition to being a valuable public relations tool, establishing a farmer’s market provides safer options for consumers, and a trustworthy platform for local farmers to sell their goods. It also helps to stabilize the industry for both producers and consumers. Now, as we near the market’s two-year anniversary, we have added plenty more food stalls with a diversified range of produce. In the beginning, about 60% of our shoppers were local Vietnamese. Fast forward two years and they now make up 90% of our customers. Seeing local buyers come to understand the benefits of natural production, and to actively seek it out, has been an incredibly rewarding experience. Tell us more about how HealthyFarm works directly with local farmers. HealthyFarm Danang facilitates contract farming. This means we secure an end buyer struggling to find a reliable supply. Once connected, consumers can put in monthly order requests to their farmers. Emmy Nguyen, HealthyFarm’s managing director, and Dr. Weina inspect Mr. Loi’s new crops. We also work hand-in-hand with farmers so they have the means to meet increased market demands. It’s important that we’re able to set aside pieces of land and meticulously monitor produce yields. Our team takes care of all of the farm management to ensure quotas are met, and produce is harvested and delivered on schedule. What kind of farmers are drawn to this kind of infrastructure? Why do they want to do business with you? 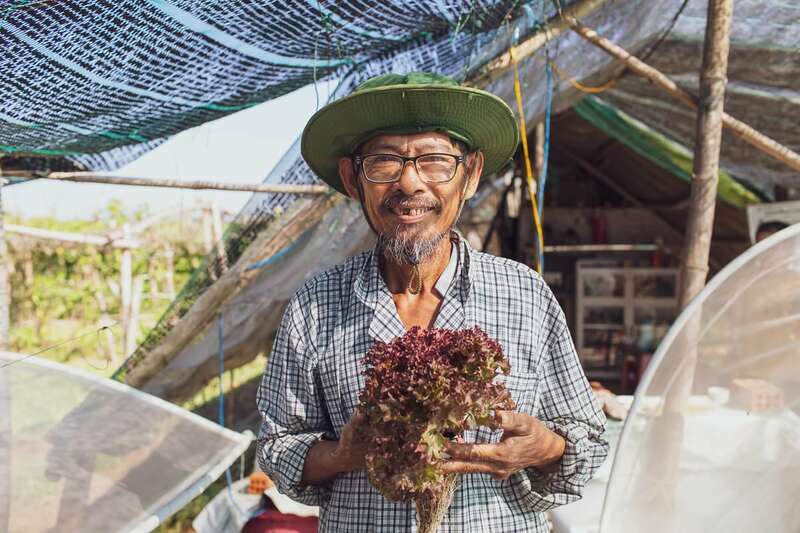 One of the first farmers we partnered with, Mr. Loi, is the leader of an informal food cooperative and a passionate advocate for natural agricultural production. At 18, he was part of an agriculture spraying team and learned the chemicals were affecting his health. After that, he joined a program on safe food production sponsored by IBM and has been interested in clean production ever since. These are the kinds of farmers that we attract, and we love working with them. As in any field, it is difficult to build trust, even within an average-sized agriculture community. The most important things are relationships and consistency. We supply both by bringing constant business to farmers and ongoing support and information to all parties. By allowing people to access safe, new markets and take advantage of HealthyFarm Danang’s trusted products, our services become very valuable. Mr. Loi with his first crop of Romaine lettuce, a premium crop in Vietnam. Tell us about food certification. How does it work, and why is it important? 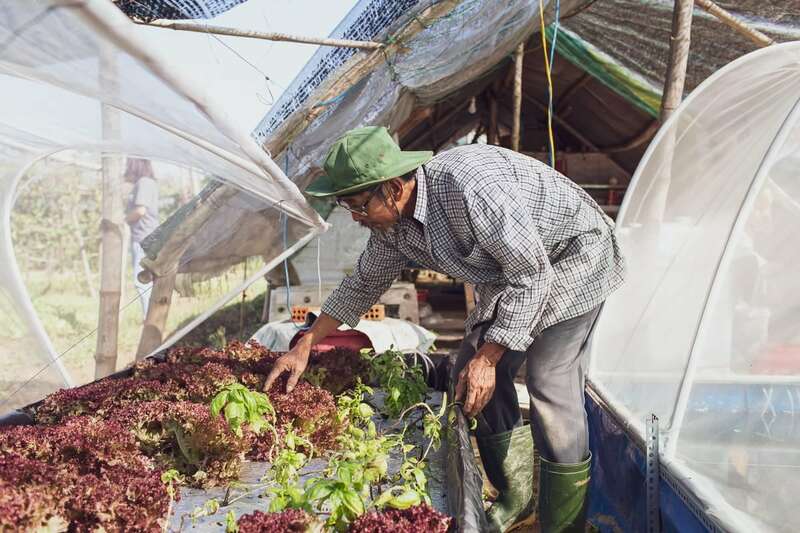 We prefer to talk about “clean food” and avoid using the term “organic.” There are Vietnamese certificates for organic production, but more infrastructure is needed before people will give it recognition. To overcome this we have built a community-driven approach into the core of our business model. The farmers market gives all parties the chance to meet face-to-face and talk shop. I think this type of environment compliments the establishment of trust, and is an opportunity for farmers to help customers better understand their product. 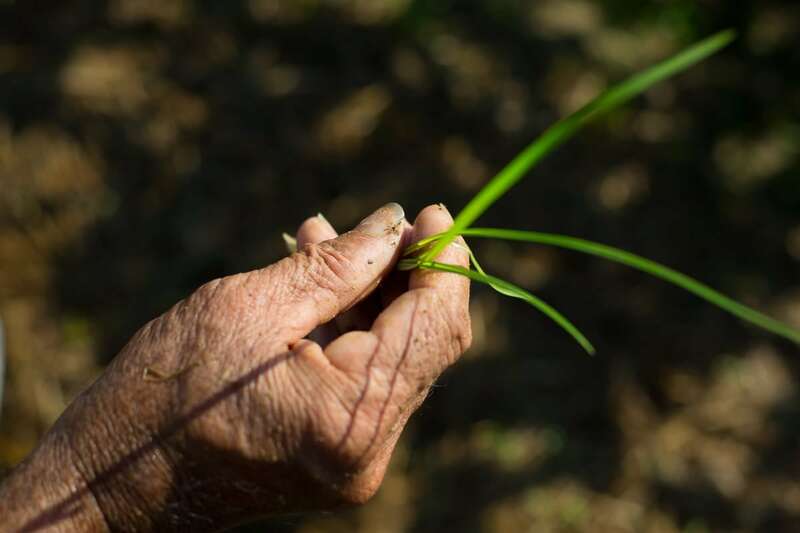 When we scout for farmers, we screen their products based on USDA and EU organic standards. We manage quality control by means of farm visits and lab testing. Due to the costly and time-consuming process of acquiring USDA certification, we can’t technically say our goods are organic according to some established standards. In our line of work, trust and positive incentives are critical. Farmers will not use chemicals so they can remain in good standing with HealthyFarm and our network. The consumers trust the farmers because they believe in our brand and know that our farmers will maintain high standards. Dr Weina and Emmy Nguyen with Mr Loi, HealthyFarm’s most passionate farmer and longtime advocate for clean produce. Why locate your project in central Vietnam? Danang has become a noticeable hub for startups and entrepreneurial ventures. The impact we were able to make here is much more tangible compared to larger markets in Hanoi and Ho Chi Minh City. In more developed markets, agricultural issues tend to be more complex and less community-focused. Direct impact is hard to pinpoint. That’s why we love working in a smaller community alongside like-minded businesses. By working out of Danang I feel our work will create real and sustainable impact throughout the entire region. We are working to expand within Vietnam and to other Southeast Asian countries. There are a lot of opportunities in Myanmar, since the concept of clean farming is still in its infancy. 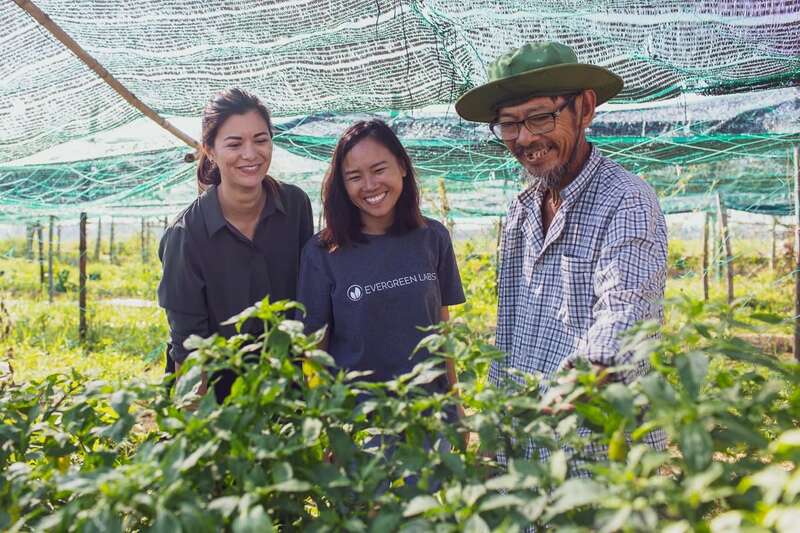 We’re also keen on building partnerships with like-minded groups like Dat Butter, a Saigon-based social enterprise that educates the market on sustainable peanut and cashew butter production. We’ve already partnered with them and will soon have our own cashew and peanut farm. Mr. Loi tends to the trial hydroponics with HealthyFarm’s help. Finally, we are investing in low-tech solar dryers and hydroponics for our farmers. Hydroponic farming has inarguable benefits. Hydroponic systems allow more variation for seasonal crop rotations with faster harvest rates, and they do so without the need to worry about weather damage. Due to central Vietnam’s extreme weather patterns, we decided to make all our HealthyFarms weather-resistant. Dat Butter, the Saigon-based social enterprise I just mentioned. They share our values and are working to build better systems for producers while providing better produce for consumers.